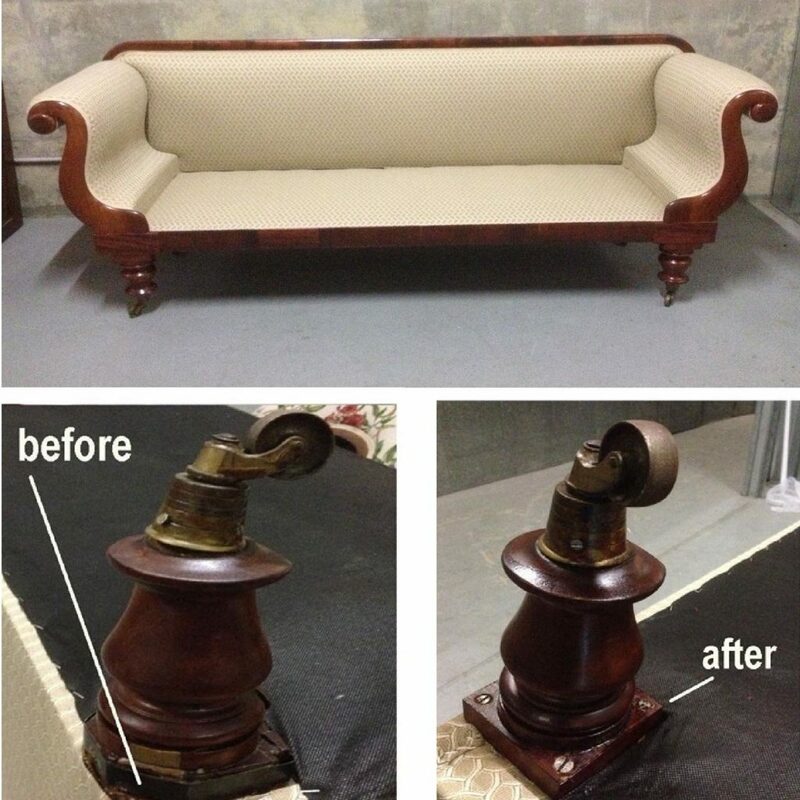 Aubert Furniture has the professional know-how to repair your antique furniture back to its former glory. 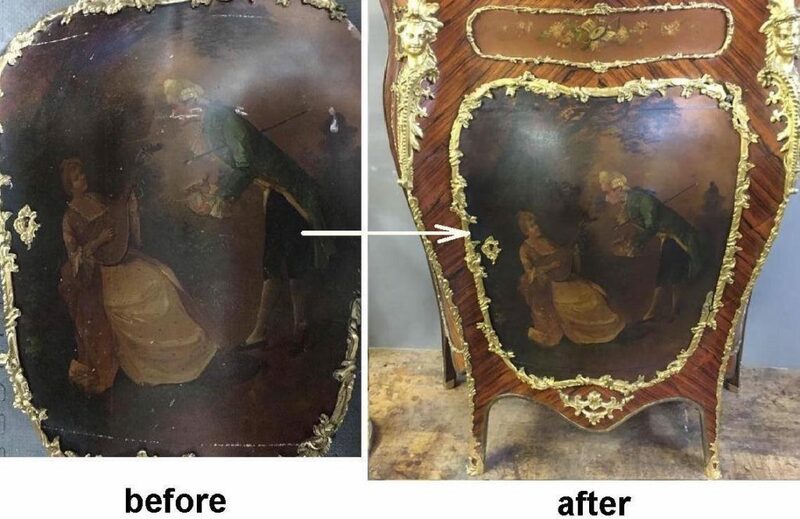 We specialise in carrying out detailed complex repair work to antique, vintage and fine furniture. Typical repairs include scratched and dented surfaces, broken sections, heat marks, broken and loose chairs, and transit damage. We also work with insurance claim damage and provide FREE quotations from photos. It's reassuring to know, if your beloved family heirloom breaks, we can fix it like it never broke in the first place Repair to cracked and broken crest rail of Victorian English dining chair c1870. 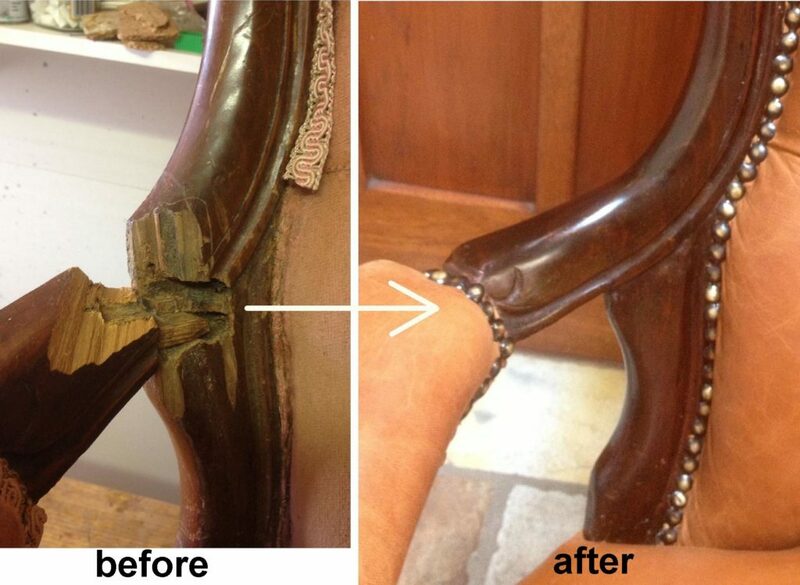 If you would like to see more amazing chair repairs like this one click here. 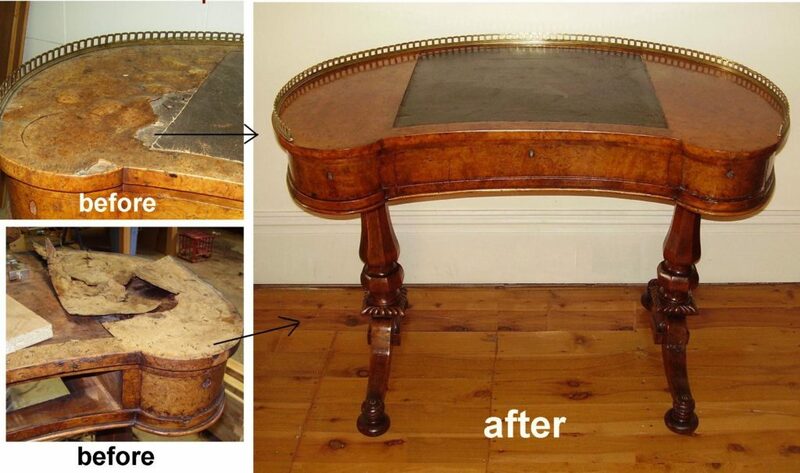 We recently repaired this Victorian 12 seater extension table top which had suffered some bad marks over the years. We successfully removed all the burn marks using traditional restoration techniques and polishing. The natural age, colour, and patina were retained in the process. Recent repair and restoration work to English Victorian kidney top desk for Marna from Wahroonga. Circa 1860. Detailed veneer repairs to water damaged top involving veneer splicing and section grafting of burr walnut veneer. Traditionally French polished by hand to a fine finish. We recently completed conservation-and repair to this Vernis Martin bombe commode for a customer in Neutral Bay. The commode was in very bad shape when we received it and was missing many sections of king veneer. The door was broken off at the hinge and the Vernis Martin decoration on the door required fine art conservation to repair all the damage. The customer was thrilled with our restoration work on the commode. Jessica from Beecroft had been fighting with her chest of drawers for years and finally, it died ... well almost. All the drawers were broken and jammed when it arrived at our workshop and it was totally unusable. 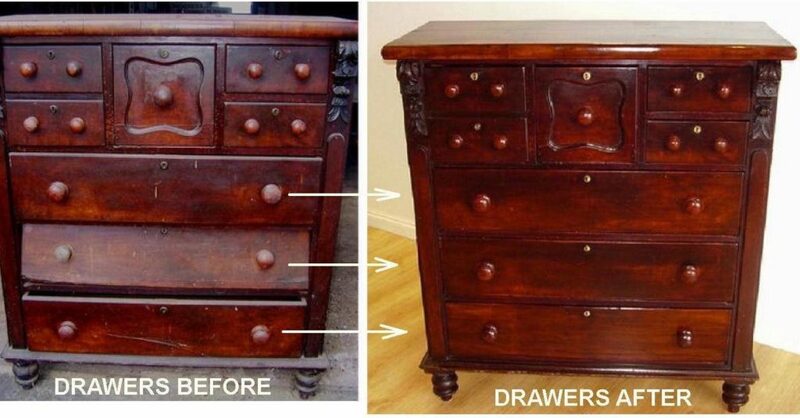 Once all the drawers, guides, stops and runners were repaired, the chest of drawers operated perfectly once again. Jessica was happy the fight was over and now enjoys using the chest of drawers every day. Peter from Glebe awoke to an almighty crash recently at 2am in the morning, only to discover his precious antique Victorian mahogany dining table had exploded under the weight of many books that were stacked high on the table top. We delivered the table back to Peter with the base perfectly repaired. Peter was happy that he could sleep well again. 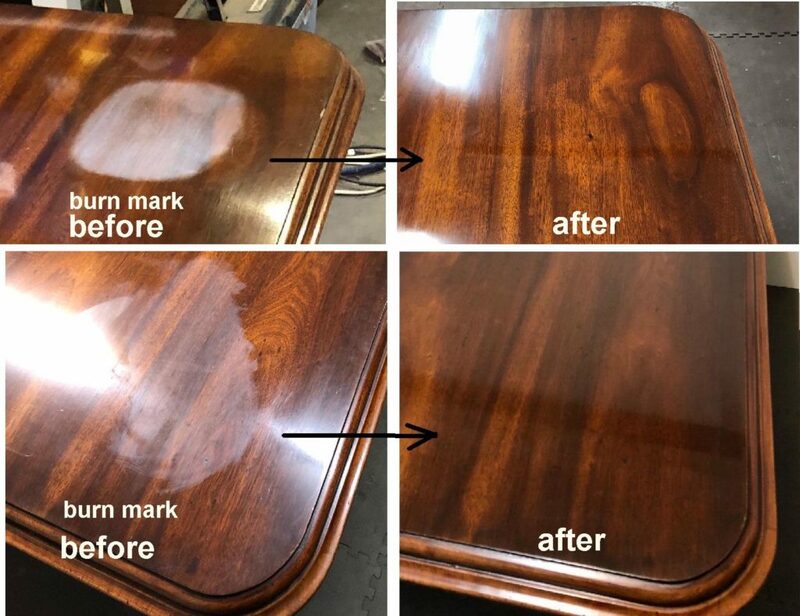 Our customer was devastated when she was told her antique Victorian table was beyond repair by two other restoration companies. The table had been stored for years in a shed and the customer was unaware of a roof leak the whole time. The edge of the table had suffered wet rot and a lot of water damage to the timber. 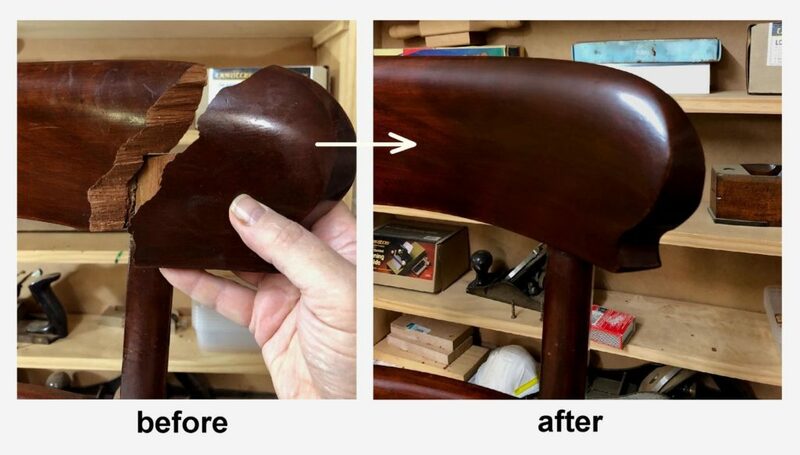 The process to repair the damage involved splicing in new sections of mahogany and re-shaping the table edge as well as treating and restoring all the water damaged areas and replacing missing veneer. The customer was thrilled to have her beloved table restored to its former glory and all the damage repaired.